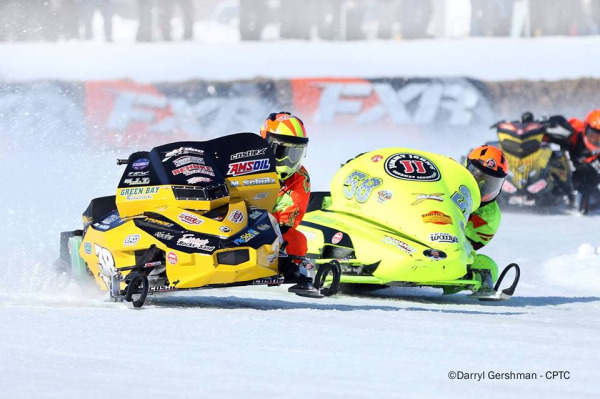 Offering superior cylinder services since 1979, U.S. Chrome is proud to serve professional racers and weekend riders alike in the ATV, snowmobile, motorcycle, dirtbike, marine and automotive markets. 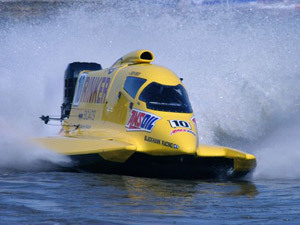 We offer fast services and offer one of the best turntimes in the industry. Fill out an order form now to get started. 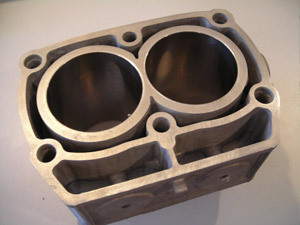 U. S. Chrome's patented Nicom plating will improve the performance of all motorsport engines. 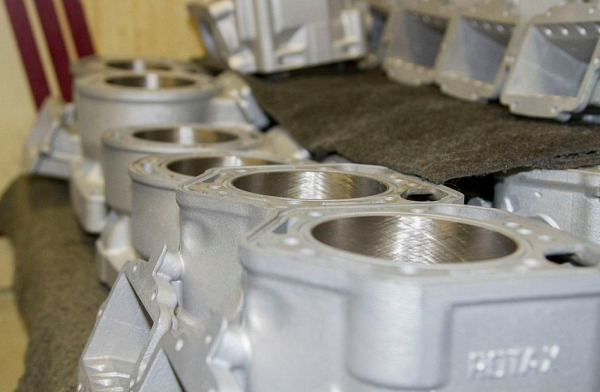 Unlike inferior processes, our coatings offer superior durability, thermal heat dissipation, lubricity, and hardness over OEM factory plating or that of the competition. We are confident in our ability to restore or repair beyond your expectations. This is why we offer a 1-year warranty for defects in material and workmanship from the date of purchase. 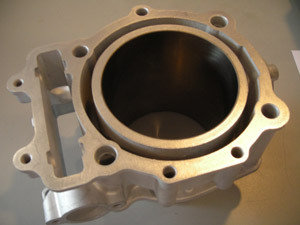 To see all the details of our warranty view the bottom of our cylinder plating order form. For questions and concerns call or contact a US Chrome restoration specialist. Are You Getting the Most out of Your Piston's Potential? 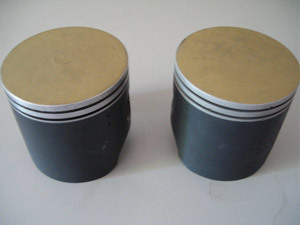 Without US Chrome’s abradable powder coated piston services, your motorcycle, boat, ATV or snowmobile may not be offering the best performance possible! 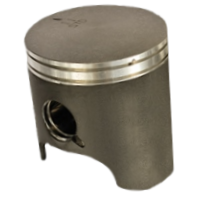 Cylinder distortions - resulting from standard operational loads, temperature variations and assembly inconsistencies - create a loose piston fit. 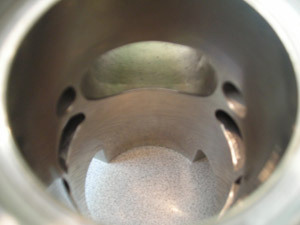 Piston engineers purposely size down to ensure the piston will reasonably accommodate these inconsistencies, preventing scuffing or engine lock. But this improper fit means lost output. Abradable powder coatings fill gaps with a degradable graphite layer which wears down in the spots of greatest friction to create a perfect fit after it’s properly broken in. 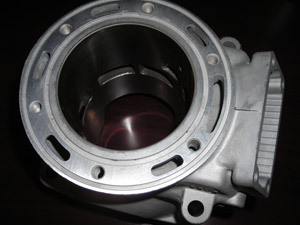 The perfect seal minimizes secondary motion and allows optimal compression and output. Oil Load is spread out to a much wider contact point, reducing friction and eliminating piston slap and rocking. 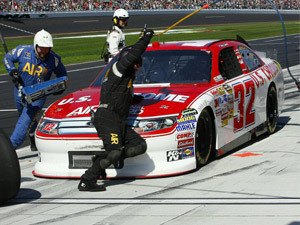 US Chrome has been applying APCs from Line 2 Line coatings since 2009. 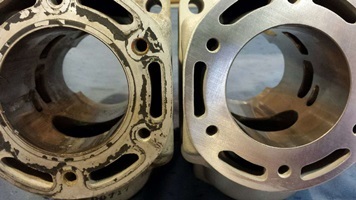 Our piston coating services are safe for all engines, will delay failures and reduce vibration in two-stroke, four-stroke and vintage motors of all types. Learn more about US Chrome’s abradable piston coatings and check out the video from Line 2 Line coatings. U.S. Chrome is proud to announce the TriCom family of anti-corrosion coatings. 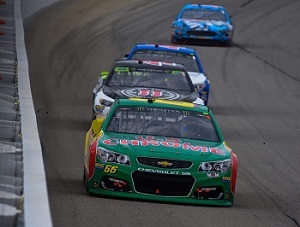 TriCom coatings are exclusive to U.S. Chrome. The all-new electroplated cobalt chrome carbide (Cr3C2) coating offers superior anti-corrosion and wear resistance properties. Non-toxic and environmentally friendly, TriCom is ideal for use on farming equipment and other applications with excessive rotational wear. With low frictional characteristics up to 800°C, TriCom can run against a plethora of metals. 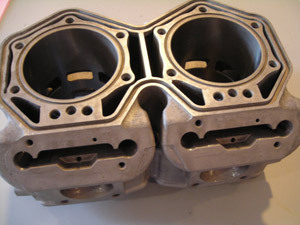 We Buy used/worn or Damaged Cylinders! Pol-S 550cc EC55PM - Plated Version Only! 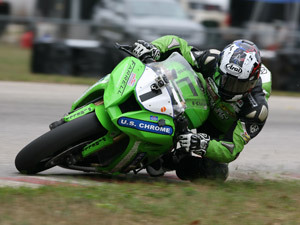 U. S. Chrome is interested in almost all two-stroke, dirt bike, motorcycle, and personal watercraft cylinders. These are only a few of the cylinders we will buy. To view our entire buying list for cylinders click the link below. Contact our cylinder repair shop or fill out a cylinder plating order form now for performance-driven cylinder solutions. 12 - 14 Business Days. 4 - 5 Day Rush Service is Available for $100 - Please call for details.